Also the mass of the brown dwarf is 104.11 which I have never seen. Lifeterra Brown Dwarf by Harb. My Brown Shelter (found during Harb's challenge). Frozen titan, but it looks like it has large oceans. Something other than water? EDIT: Although blue as an ocean of water, the colour really reflects the colour of the sky, I suppose, so blue doesn't necessarily mean water. I'm just curious about what the class "frozen titans" in SE is. Titans are ice worlds with liquid hydrocarbons on their surfaces. Forgive my skepticism, but I find it extremely difficult to believe that you didn't know that. Although blue as an ocean of water, the colour really reflects the colour of the sky, I suppose, so blue doesn't necessarily mean water. It's not blue, toggle the atmosphere. And our ocean actually is blue, water is blue, it does not just reflect the color of the sky. I just find the term confusing. It's not very obvious to me what it is. I understand that "titan" has its name from Saturn's Titan, which has some relatively small areas of liquid hydrocarbons. It's difficult (and dangerous) to toggle the atmosphere in real life. If water is intrinsicly blue, why is the ocean grey when it's overcast? When in doubt, refer to your 0.96 changelog file, thought I don't think it should take very long to commit the term to memory. 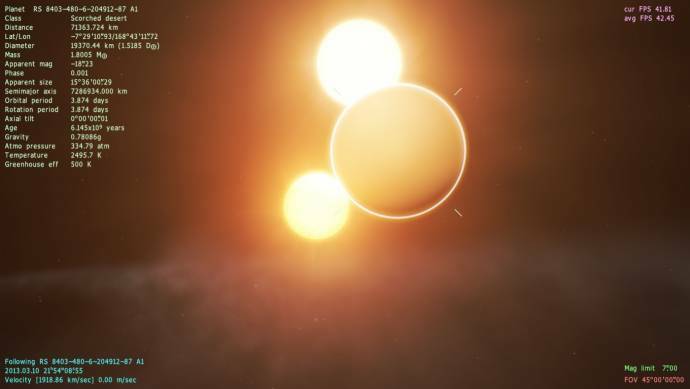 It's difficult (and dangerous) to toggle the atmosphere in real life. If water is intrinsicly blue, why is the ocean grey when it's overcast? Because it does also reflect the sky. But it's a well established fact that water is blue; it scatters shorter wavelengths of light in a manner similar to the atmosphere. You know, there are some people out there who believe that the sky is blue because it is scattering the blue color of the ocean. I'm not joking. Anyway, the point is that the sky is blue and the ocean is blue, and neither needs the other one to be blue because each is intrinsically blue due to its physical properties. Ok. Sorry for the stupid question. I wonder whether such worlds with vast hydrocarbon oceans are realistic, though. But they look nice. I grew up with a fascination of Titan, btw. Not for its hydrocarbon lakes (this was in the early 80's, so little was known with any certainty about what was under the haze), but because it was a moon with a thick atmosphere and pressure similar to Earth's, a place in our solar system outside Earth where one could breath and smell the air at least for a short while and not pass out painfully within seconds. One might consider to heat the air somewhat first, though. It's a very safe bet that some do exist somewhere. 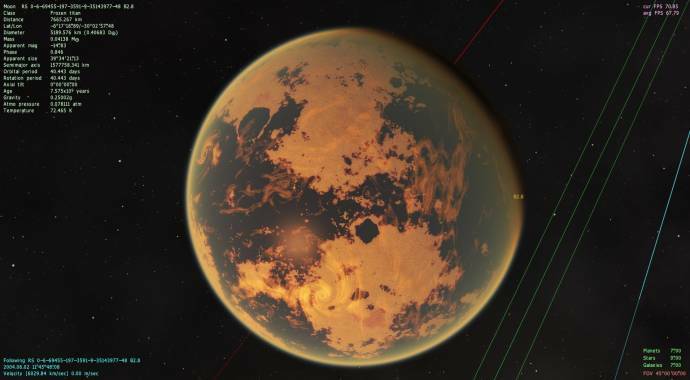 Titan has large bodies of hydrocarbons, and there's nothing special about it. If it were just a little colder and a little wetter then huge parts of its surface would be liquid. Worlds like that are probably fairly common in the universe. One might consider to heat the air somewhat first, though. I am thinking that aurorae in 0.97 shift and move way too slow. A 5x-10x speedup would make it more realistic IMO. Doesnt know if this is an anomaly, a bug or simply a lucky shot, but i found a terra orbiting around a desert and that terra (moon) is actually LARGER than the main body! PC: Intel i7 4Ghz, 32GB RAM, nVidia GeForce GTX 980Ti (6GB VRAM), Windows 10 PRO 64.